Our fundraising efforts through 2019 will be focusing on the initiatives outlined below. Read below or click on button to download. We are currently in production on a new short film that is targeted for kids aged 5 to 10-years-old. This 22-minute film, along with a supporting Education & Discussion Guide and infographics, will be made available to schools and youth organizations at no cost. It will serve as a powerful tool for teachers and students to engage with each other on the issue of plastic pollution. Allocation of Funds: These funds will specifically be used to translate the film and education materials into multiple languages. This is of the utmost importance in order to spread the message as wide as possible, especially in the Asian countries where the problem is most prevalent. It gives us the best shot of achieving the goals of informing, inspiring and inciting action by millions of people, that can lead to solutions and meaningful change. Production on our new short film for kids. This amount will allow us to complete translations in the following languages: Spanish, French, German, Portuguese, Chinese, Korean, Vietnamese, Tagalog, Malay, and Thai. The costs associated to this includes translating the full film, short social-friendly clips, the full Education & Discussion Guide, and accompanying infographics. Translations will be completed by a mixture of our internal team, as well as various partners that we have in each region. *Each additional $5,000 allows for another language. Ideal additions would be Japanese, Arabic, Khemer, Hindi, Bengali, Italian, and Greek. This is an exciting new campaign that we plan to launch in January 2019. 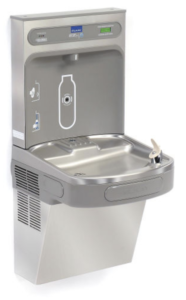 It is in partnership with Elkay, the world’s largest manufacturer of drinking fountains and water refill stations. Its primary goal is to empower youth to be part of the solution to reducing single-use plastic waste. It will see Plastic Oceans provide and install water refilling stations in under-served schools around the globe, while also providing a social entrepreneurship element, through which students will raise funds to purchase additional refilling stations for their campus – thus empowering them to directly be part of the solution. One Elkay water refilling station. 100 plastic-free reusable water bottles. These serve as a seed quantity that students will sell as part of a fundraising campaign that they organize and run. Those funds are used to purchase additional refilling stations. Additional water bottles will be made available at our cost. *This will fund the program at 100 schools around the world, inspiring a new generation to rethink plastic, while also keeping up to 50 Million plastic bottles from polluting our environment over the next several years. Silicon Valley Bank beach cleanup. We actively pursue ongoing activism with our full-time team, volunteers, and also with other like-minded non-profits, education and research institutions, governments, corporations and others. These activities include such things as beach cleanups, participating in conferences, educational sessions, and more. We specifically seeking funds that will allow for one organized beach/sea educational cleanup per month in 2019. Allocation of Funds: Each beach cleanup has an average cost of $2,500. This fluctuates depending on location, size, volunteer support, and associated travel for team leaders if no local person is available. The funds cover supplies, such as buckets, waste bags, latex gloves, rakes, transport of plastic waste, first aid kits, liability insurance, marketing, and any permits that are required by local municipalities. For the full year, we would also request support that allows for the production of Plastic Oceans banners and other supporting materials to help organize and promote the beach/sea cleanups. Events will be in the US, UK, Canada, Mexico, Chile, Indonesia, and Thailand. This ties in with all of our awareness efforts, especially those that are outlined in this document. 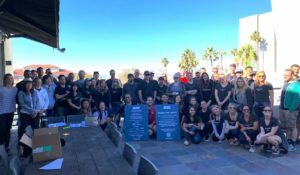 It is essential for us to continue to develop a team of people that can serve as educators – and inspirational leaders – on the topic of plastic pollution. These are our true champions … those that can best engage on the issue with their local communities, and in local languages. We are in need of funds to better organize this effort, and most importantly, to expand it globally. Allocation of Funds: With the guidance of a certified educator (funds will help support the cost of this consultant), we will produce an education manual for Facilitators, outlining key facts, best practices, suggested material, expectations and goals. We will also conduct training sessions, developed with the guiding hand of the certified educator. After the initial training is completed, Facilitators will have access to an online resource folder that is updated regularly, providing them with all the latest news and facts about plastic pollution. Our goal is to educate 100 facilitators in 2019. Film and other digital content creation are at the core of who we are. It’s how we best, and most powerfully are able to engage individuals, communities, governments, corporations, and others. It’s not only how you achieve the greatest level of understanding on the issue of plastic pollution, but it’s also how you are able to best spread the message to the largest audience possible. Allocation of Funds: Our plan is to make 2019 our most aggressive year yet for the production of film/video content. We will not only begin production on a new feature-length documentary, but will also continue to push out a steady stream of short films, and social-friendly micro videos. 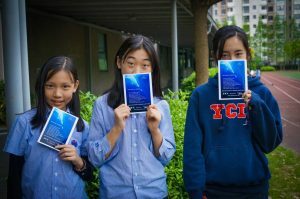 Students at the Yew Chung International School in Shanghai. Feature-length Film: $500,000 is the minimum we need to get started. Level of support determines how you or your designated entity are recognized: Executive Producer, “With Support From”, or a mention in the credits. We estimate the full cost of producing a 90-minute film to be $1M to $1.5M. That’s all-in, including some marketing budget and producing educational material to accompany the film. 10 to 22 minutes long. Topics can be developed with your team. Recognition based on amount funded. Recognition based on level of amount funded. We are fortunate to have low operational costs, and we support those by allocating no more than 10% of all donations toward covering them. This includes things like staff, website hosting, insurance, office supplies, travel; and subscriptions to services for accounting, donation management, and website maintenance.